Funky Artist's Nails to Make You Flip! 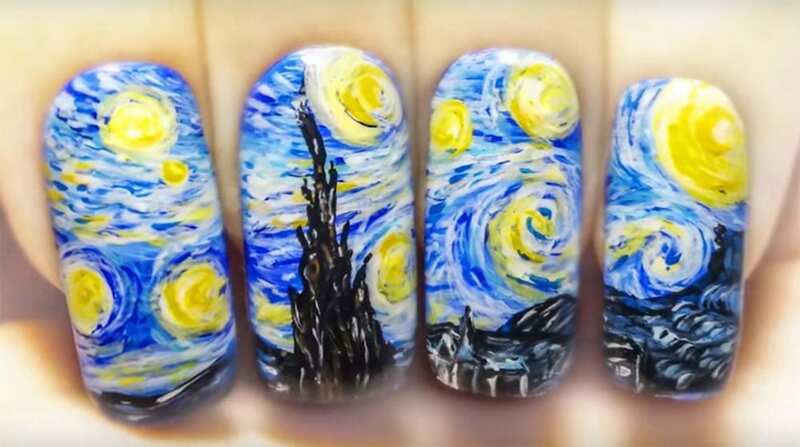 Funky Artist’s Nails to Make You Flip! You might have read the title of this editorial and be wondering what I mean by “Funky Artist Nails”. Well, let me explain. Nail art has gotten so big it’s almost like people are treating it as a famous painting or artwork. Somewhere across the way recently I have run into designs on nails that are famous or classic artist paintings. In other words, famous artists like Monet are being copied onto people’s manicures and pedicures. You can imagine my surprise when the cashier at the supermarket had Picasso nail art on her fingers. I expected her to be a unique and artsy art history major or something along those lines, but, no she wasn’t. She was not even familiar with the painting she had on her beautiful manicure! She just thought the design looked cool and had seen it on Instagram. As I opened up with her about the art she had on her nails, holding up the line, she sort of smiled and thanked me politely for the information on her nail design. I digress, this is a new trend and it’s something I think that not only people should know about, but that they should be aware they are wearing a famous artist’s art on their nails. So here are some of the best “Funky Artists Nails” I have found for you. Claude Monet isn’t just a famous artist, but a master of watercolor type looks. This look makes for a beautiful painting, but also some gorgeous nail art. One of Monet’s famous works was called Water Lilies. It was just that some beautiful water lilies that you would be proud to paint on your fresh manicure. Not only was this particular piece created towards the end of his life, but it was considered an impressionist style and one of his finest paintings ever created. Here is the tutorial for the Claude Monet Water Lilies nail art. Another popular piece by Monet that seems to be popularly appearing on women’s nails everywhere is Lady with a Parasol. This piece by Monet was considered one of his finest figure portraits ever done. It was done originally on an oil canvas, but as most people have found also looks stunning on your fingers nails. What made this painting so popular in 1875 and makes it so popular on ladies nails today? Well not only is the subject matter beautiful and the coloring fantastic, but the intricate shading within the painting itself draws attention to it making it whole. The same goes for your nails. That being said when you’re putting this painting on your nails you need to be extra careful with the parasol shading. This is what makes or breaks this painting and this nail art. Here is the tutorial. Starry Night is one of Vincent Van Gogh’s most recognizable and famous paintings he ever created. Not only are the colors in it rich, but there is just something magical about this piece all these years later that makes even the least cultured of us appreciate it. That being said it is the perfect painting for nail art. Most nail artists do this design freehanded. While I find it hard to do this many prefer the outcome of the copied painting doing it freehanded. So here is the freehand tutorial for Starry Night by Vincent Van Gogh. Pablo Picasso was best known for his abstract artwork. Not only was it unique, but many nail artists have found it incredibly easy to replicate on fingernails or toenails. Because Picasso is abstract you don’t have to worry too much about messing up by putting a line in the wrong spot, again making it perfect for nail art. You can keep it simple with one color or two colors or even a multitude of neon colors. Either way, Picasso nail art is the BIGGEST trend on Instagram today. Not only does it look classic and beautiful, but it’s easy to do! Here is one of my favorite and more complex Picasso tutorials. If you’re a fan of pop art you know the most famous pop artist of all is Andy Warhol! You have seen the iconic different colored paintings or photos of the same item in different colors repeating over and over again. It almost looks like a repetitive comic strip which is exactly what Andy Warhol was going for and what most pop art fans are going for on their nails! You can do any item you want, but one of the most popular looks involves a different colored banana because it’s easier than a person’s face. Let’s just get that out of the way right now. To check out these Andy Warhol inspired nails, go here. You will find the tutorial to be quite helpful in replicating them on yourself. With so many great artists out there from history or that are up-and-coming, it will be interesting to see where the famous nail art trends head in the next year or two. Maybe by then, we will have new techniques and our own newer version of Andy Warhol or Vincent Van Gogh to draw inspiration from.